http://rbrt-ruso.com/ looks to be a site for a Canadian golf course. 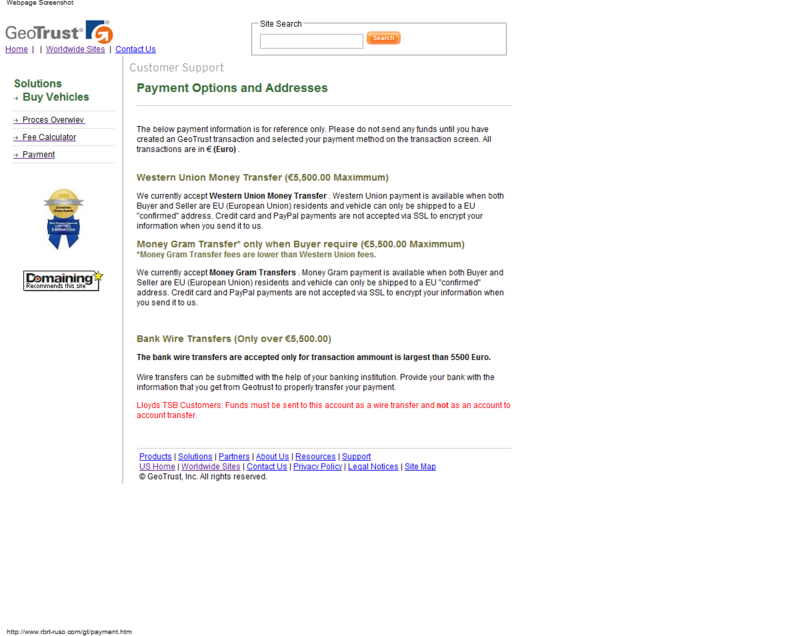 The fake site is asking for payments via Western Union and MoneyGram. The below payment information is for reference only. Please do not send any funds until you have created an GeoTrust transaction and selected your payment method on the transaction screen. All transactions are in € (Euro) . We currently accept Western Union Money Transfer . Western Union payment is available when both Buyer and Seller are EU (European Union) residents and vehicle can only be shipped to a EU "confirmed" address. 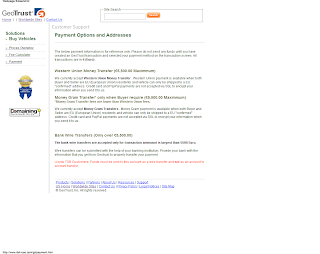 Credit card and PayPal payments are not accepted via SSL to encrypt your information when you send it to us. *Money Gram Transfer fees are lower than Western Union fees. We currently accept Money Gram Transfers . Money Gram payment is available when both Buyer and Seller are EU (European Union) residents and vehicle can only be shipped to a EU "confirmed" address. Credit card and PayPal payments are not accepted via SSL to encrypt your information when you send it to us. The bank wire transfers are accepted only for transaction ammount is largest than 5500 Euro. Wire transfers can be submitted with the help of your banking institution. Provide your bank with the information that you get from Geotrust to properly transfer your payment. Lloyds TSB Customers: Funds must be sent to this account as a wire transfer and not as an account to account transfer. Both parties agree to terms of the transaction, which includes a description of the vehicle, sale price, number of days for the Buyer's inspection, and any shipping information. The Buyer submits an available payment option. GeoTrust verifies the payment. Processing time varies by payment method. Upon payment verification, the GeoTrust is authorized to ship vehicle and submit tracking information. 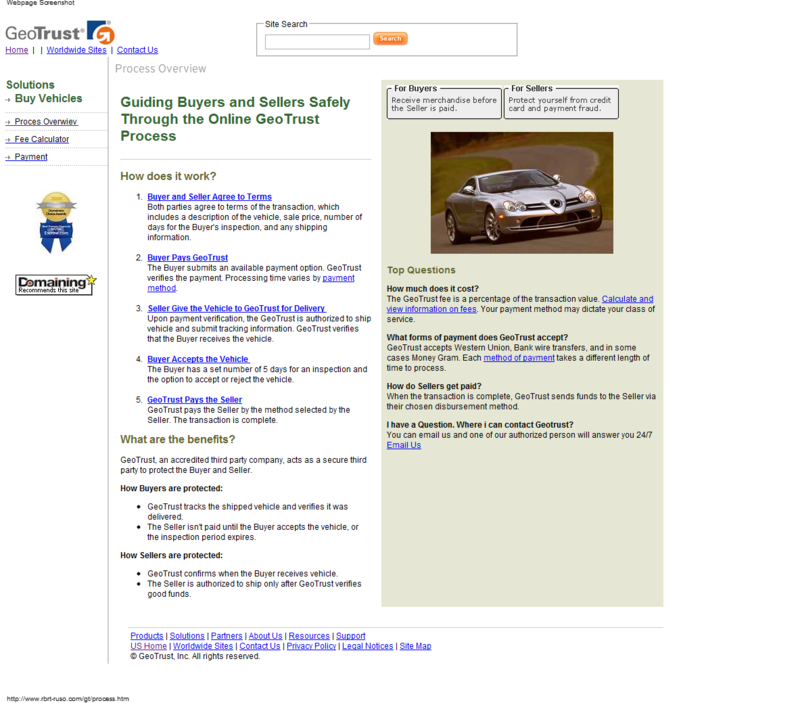 GeoTrust verifies that the Buyer receives the vehicle. The Buyer has a set number of 5 days for an inspection and the option to accept or reject the vehicle. 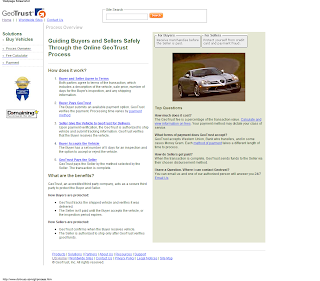 GeoTrust pays the Seller by the method selected by the Seller. The transaction is complete. GeoTrust, an accredited third party company, acts as a secure third party to protect the Buyer and Seller. GeoTrust tracks the shipped vehicle and verifies it was delivered. The Seller isn't paid until the Buyer accepts the vehicle, or the inspection period expires. GeoTrust confirms when the Buyer receives vehicle. The Seller is authorized to ship only after GeoTrust verifies good funds. The GeoTrust fee is a percentage of the transaction value. Calculate and view information on fees. Your payment method may dictate your class of service. What forms of payment does GeoTrust accept? GeoTrust accepts Western Union, Bank wire transfers, and in some cases Money Gram. Each method of payment takes a different length of time to process. When the transaction is complete, GeoTrust sends funds to the Seller via their chosen disbursement method. I have a Question. Where i can contact Geotrust?